This post sponsored by Kettle and Fire. I love bone broth and they sent me some of their delicious product when I am unable to make my own. This post contains affiliate links as well. Thank you for supporting my blog! 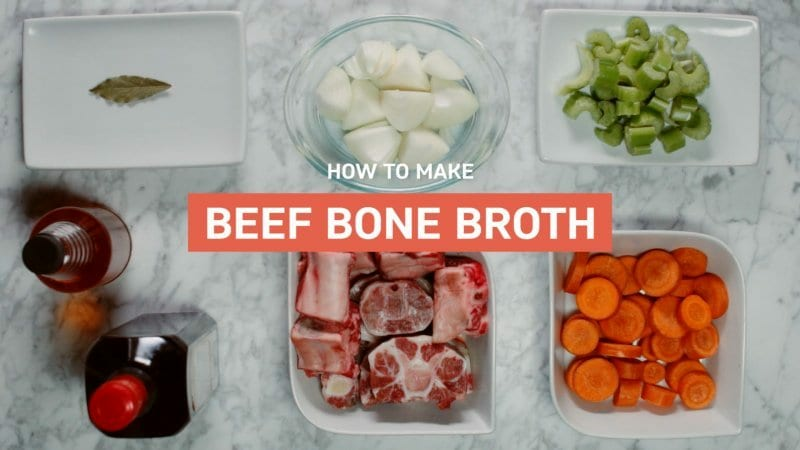 This savory beef bone broth is a simple recipe that is the perfect remedy for a winter cold or just as a light pick-me-up! Winter is in the air and so are all those nasty germs and viruses. Nothing cures the the common cold better than a steaming cup of bone broth. Yep, you heard me right. Beef bone broth is gaining a lot of popularity lately for its many nutritional benefits including immune support. This broth is so simple to make and uses just a few simple ingredients. I like to make a big batch in the crockpot and store it in mason jars in my fridge. Because it is so light, yet so savory I like to serve it in a coffee cup as a sort of winter aperitif. 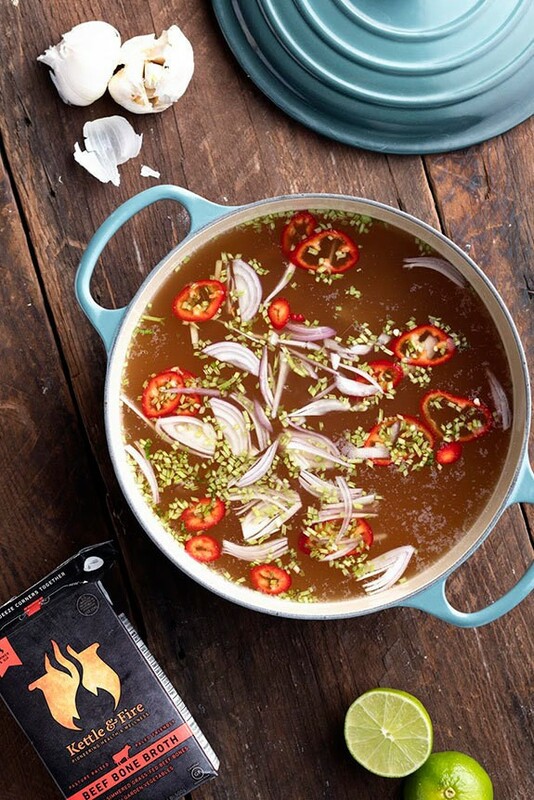 You’ll notice that this recipe does require a long simmer time, so for impromptu entertaining or parties I’ve found that Kettle & Fire has a fabulous beef bone broth. 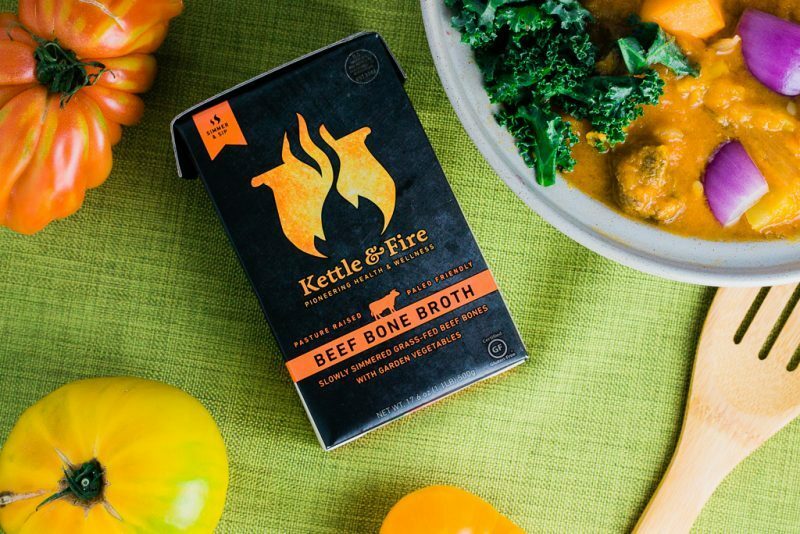 I like that they have shelf-stable containers and they use grass-fed beef and organic ingredients, which really is the key to all of the bone broth’s nutritional benefits. 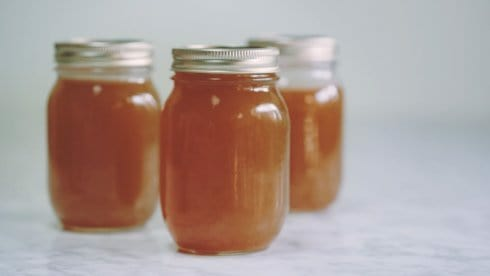 So, whether you just want a steaming cup to cure your winter cold or you have a houseful of guests, beef bone broth is a light and savory snack, aperitif or tapas. Place the beef bones in a single layer on a sheet or roasting pan and drizzle with olive oil to evenly coat. Roast the beef bones for 30 minutes. 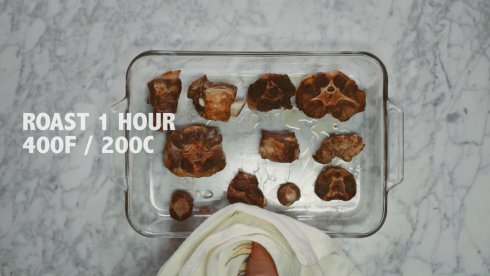 Flip each bone over and roast for an additional 30 minutes. Put the roasted bones, chopped vegetables, bay leaf and cider vinegar in a large crock pot or soup pot. After it has reached a high simmer, reduce the heat to low and let simmer for 12-24 hours. 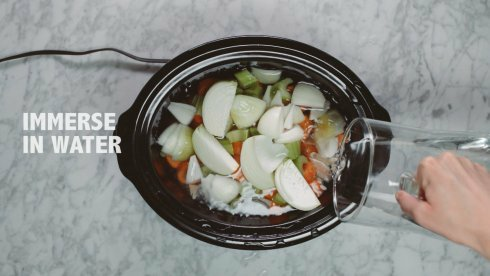 Be sure to add water as needed to keep all the ingredients submerged throughout simmering. Cool to room temperature and pour into jars and let them cool in the refrigerator for at least 1 hour. To serve, skim the top layer of fat off the broth and heat to the desired temperature. 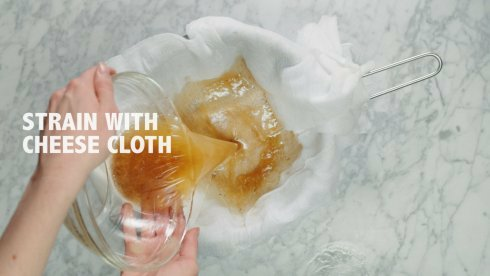 Here is a short video to show you how easy it is to make your own at home! 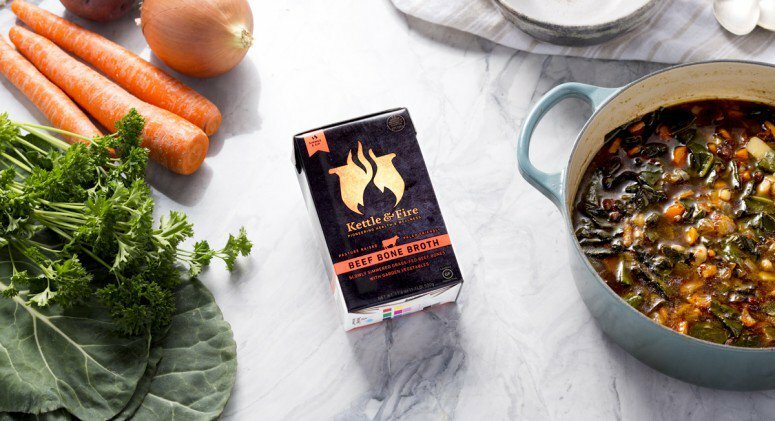 If you are looking to have some on hand for your bone broth emergencies check out the Kettle and Fire Website and stay stocked during these chilly months! Perfect for your Paleo or Whole 30 New Year’s Resolutions too! I can’t wait to attempt to make this at home instead of buying it from now on. Thank you! It’s super easy! You will love it!